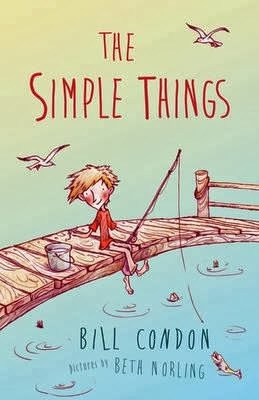 The Simple Things is possibly the simplest, yet most deceptively deep book I have read in a long time, which makes it incredibly difficult to review. Norling’s beautiful cover art and internal illustrations add an extra layer of contrast to the emotional impact of this book. As a whole, I is a magical mix of simplicity and complexity. Ten-year old Stephen is spending three weeks with his cantankerous Aunt Lola. He is certain it will be the longest and most boring three weeks of his life. But as he is about to discover there is more to life than TV and electronic games. During his stay he learns about life—and death—and everything in between, finds friends where he least expects to, and reminds an old woman how it feels to be alive. “Now my bottom lip trembles. I bite down on it but I can’t make it stop. ‘Sorr—’ I stop myself, just in time. Condon’s gift is that he doesn’t write stories so much as he writes characters who then share their lives with the world. If he were to announce tomorrow that he is some sort of New Age medium who channels the souls of real people, I would have no trouble believing him. Stephen, his parents, Aunt Lola, Allie and her pop are all so alive that I feel I’ve met them in person. The Simple Things is a lesson in life for readers of all ages. I strongly urge parents and teachers buying this title for their kids to take a moment to read it first. I guarantee you’ll be richer for the experience. Jenny Mounfield is the author of four books and several short stories for young people. She lives in Brisbane with her husband and two of her three grown children.